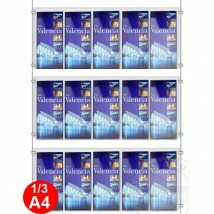 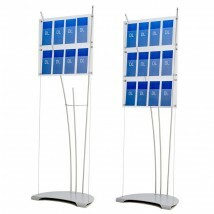 Our range of leaflet dispenser cable display kits is designed to bring you options to display all literature types. 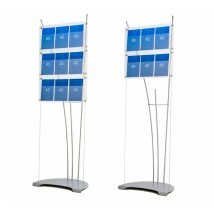 Create an eye-catching information point for estate agents, travel agents at exhibitions and trade shows. 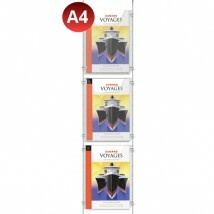 Use to hold leaflets, brochures, magazines, catalogues and other types of promotional material. 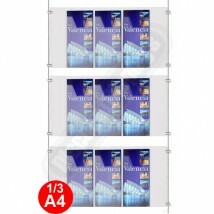 Our leaflet dispensers are made from clear Perspex, fitting in with any colour scheme. 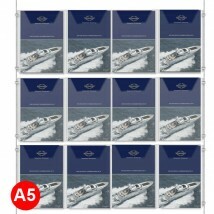 A range of literature pocket sizes, attach pockets by clamps onto 1.5mm thick cables. 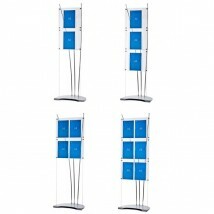 Variety of fixing options available including wall to wall, floor to ceiling and floor to wall. 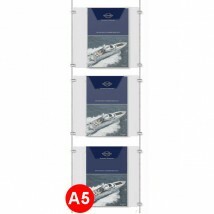 Our leaflet dispenser cable displays, literature wire display systems are available in floor to ceiling, wall to floor and wall to wall. 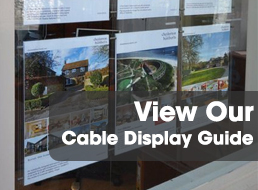 You may also be interested in our freestanding cable displays, poster holder kits, cables and clamps and complete cable systems.